In readiness for the imminent launch of Oculus’ ‘Touch’ motion controllers, the company have rolled out the new ‘Guardian’ feature, their version of SteamVR’s Chaperone VR boundary system for room-scale VR. The update also brings anti-judder tech Asynchronous Spacewarp and a new user reviews system. Oculus have been repeating the familiar mantra “seated VR experience” for quite some time now, a reflection of the company’s launch focus for gaming, perhaps a cautious approach to setting user expectations for safety, but most of all an acknowledgement of the company’s lack of dedicated motion controllers. As such, the company hasn’t had to worry too much about people throwing themselves into walls during frantic room-scale VR gameplay sessions and therefore, no need for an equivalent to SteamVR’s excellent ‘Chaperone’ system. As of next month however that all changes. 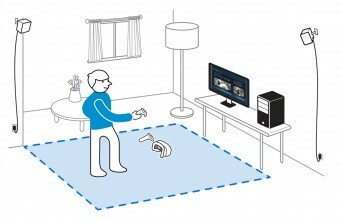 Although the company is still coy about selling the Oculus Rift as a room-scale VR system, the new ‘Guardian’ feature which is rolling out to Oculus Home users gradually worldwide, is a recognition that once the Oculus Touch motion controllers ship in December, that all changed – even if the company’s messaging is still all about “seated and standing” games for now. 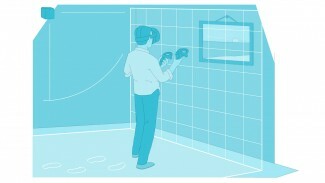 Valve’s Chaperone system, which was unveiled along with the HTC Vive at GDC in 2015, presents a hologram-style virtual wall overlaid onto your VR experience warning you when either the tracked headset or SteamVR controllers come close to colliding with a real-world wall – as defined by your room’s setup in Steam. Recently, Oculus confirmed that Guardian would be included in their SDK 1.8 update for developers to begin the feature’s inclusion. The jury is still out on Oculus’ outside-in ‘constellation’ tracking system and its suitability, viability or prowess tracking in VR at room-scale, however the Touch ships with an additional camera to mitigate against controller occlusion and you’re able to add more, should you want tracking angles to cover your room-scale play area. There are users out there with early access to Oculus Touch who have done just this and report good things, but it’s clear that running a USB cabled camera to inaccessible parts of your VR playspace may not be quite as elegant as SteamVR’s inside-out laser-based Lighthouse system. Although Oculus’ latest initative to smooth out the VR experience has been present since the prior 1.9 release of Oculus’ runtime, 1.10 marks the official banner release of Asynchronous Spacewarp. 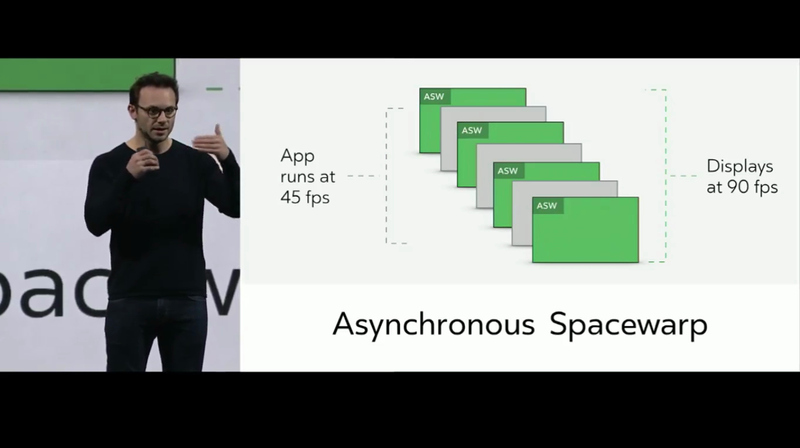 A significant evolution of Oculus’ Asynchronous Timewarp, ASW extends the anti-judder technology from just rotational head tracking to translation tracking too. As we recently reported, the feature was unveiled by Oculus’ CEO Brendan Iribe at the company’s annual developer conference ‘Connect’ who stated that the new feature could reduce the hardware costs for a VR capable PC significantly. Asynchronous spacewarp is Oculus’s new solution to fix judder caused by positional movement in the playspace. As explained by Iribe, spacewarp takes the app’s two previous frames and analyzes the difference, and then calculates that difference to extrapolate and generate a new synthetic frame. This helps smooth moving objects, even the entire scene, so when you’re moving your hands or body, you won’t have judder or ghosting images. In short, it does this by halving the app’s framerate to 45 fps when it hits a snag and sandwiches in a synthetically generated frame to return it to 90. For better or for worse, everyone feels their opinion is valid on the internet and what people say about products they’ve spent money on has become an ever stronger component of platforms and portals selling those products to us. 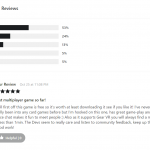 The user review feedback system which has been present in Valve’s Steam platform for some time, has become increasingly important to gamers in guiding their purchasing decisions. And now, Oculus has added similar functionality to its content portal ‘Home’. Below screenshots courtesy of the folks over at /r/oculus. 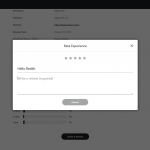 The simple review system allows those who have purchased games or applications through Oculus Home to write a review of their experiences and apply a rating out of five as a quick indicator of their satisfaction. Those star ratings are then tallied up and presented at the bottom of the game’s store presence. Personally, I do generally find this kind of user feedback useful, but such systems can be wide open abuse should moderation not be good enough. Just recently for example, Valve amended the way review scores are aggregated, removing those scores given for users who obtained the title via a Steam key. The thinking being that a developer can theoretically dole out review keys to anyone they like and therefore, the opportunity to do so in return for positive reviews was a problem. According to a report from Eurogamer, Valve thinks that some 160 titles may have artificially inflated review scores as a result of abuse of this system. The post Oculus Update Adds Room-scale ‘Guardian’ Feature, Async Spacewarp and User Reviews appeared first on Road to VR.